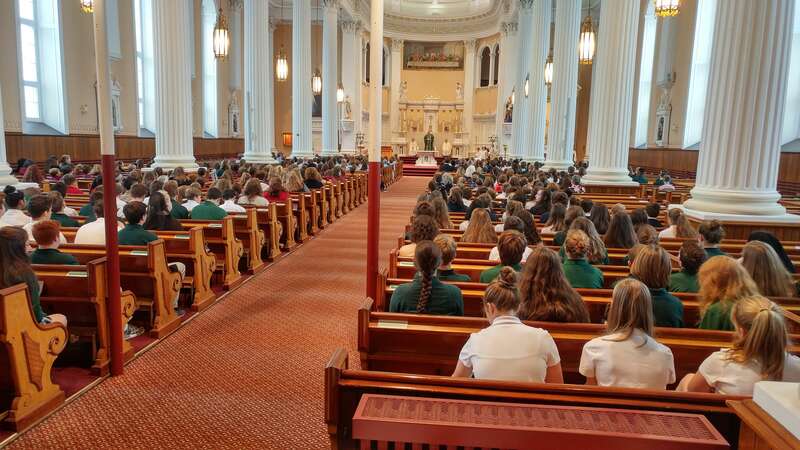 Photo Credit: Submitted/Karen Maklad - Students from Catholic schools in the Diocese of Burlington attend Mass at St. Joseph Cathedral in Burlington. The Diocese of Burlington hosted its annual Catholic Schools’ Mass at St. Joseph Cathedral in Burlington Nov. 8. About 630 students and faculty attended from 11 of the 12 Catholic schools in Vermont. Much of Burlington Bishop Christopher Coyne’s homily at the special Mass centered on Jesus’ parable about planting seeds: “Some other seed fell among thorny weeds, which grew and choked the good plants. So those plants did not produce a crop. 8 Some other seed fell on good ground and began to grow. It got taller and produced a crop. Some plants made thirty times more, some made sixty times more, and some made a hundred times more” (Mk 4-9). Bishop Coyne shared a story about when he was a pastor in Westwood, Massachusetts, at a church on the main street that had a very large lawn that went mostly unused and required a lot of maintenance. Bishop Coyne decided to let a part of his lawn go back to its natural beauty but knew it might not be well received by neighbors, especially in the middle of town. So, he had his religious education class go out in the fall, dig holes and plant daffodil bulbs randomly all over the lawn. In the spring, the unkempt lawn was ablaze in a dazzling yellow until the daffodils faded in the beginning of summer. Bishop Coyne went back to his religious education class and had them till the land and randomly sprinkle wildflower seeds. Complaints from neighbors followed as the weeds continued to grow, but he told his students to be patient. Later in the summer, wildflowers burst through the weeds in an array of stunning color, and suddenly the church lawn became the center of attention in the middle of town.